To start my Holiday Wardrobe..a simple, and hopefully a quick pattern to get my sewing momentum going. Vogue 9190 Lime boiled wool from melbrestash2017. There wasn't much of this beautiful wool. This Marcy Tilton looked like the perfect travelling jacket .. could I get it out? The front needed to be changed to just a single layer, 5 cm/ 2 inches added to the hem length, sleeves looked a bit on the narrow side and the boiled wool was thicker than the recommended fabric.. so only 1 cm / 3/8 inch seam allowance, the 2 pieces for the back were morphed together and the fullness in the lower back piece removed by folding. Black contrasting Foldover was used to finish all the raw edges. I was really happy with the longer length on this jacket and the option to turn the sleeves back for a cuff. Best part putting it on and loving it. I used a one way stretch cotton jersey that had a striped pattern. I decided to omit cutting the front and back on the fold and add centre seam allowances for the front and back. The front and back had the Stripes cut horizontally on one half and vertically on the other. Foldover elastic was sewn over both the centre front and centre back seams. Neck and armholes finished with self bias and topstitched. A simple pull-on pair of pants in the same fabric as the Burda Top. They looked slim fitting with a not too bulky elastic waist finish on the pattern. The pant leg width was too wide. Reduced the leg width by two inches by sewing on the inner leg (one inch seam) tapering to the crotch and sewed black Foldover elastic on the outer pants side seam. The two pieces were comfortable for the long flight and the jacket kept the air-conditioning drafts at bay. Yes food did hit my top...who knew the dinner roll had a liquid garlic centre! Oh and the food stain wasn't obvious. As soon as I saw these funky pants Vogue 9114, I knew I just had to make them. I did prepare myself by reading the pattern reviews and was looking forward to sewing them. Gosh these were a pain to get right..No wonder I prefer dresses and skirts. Well after the finishing the pants I really was amazed at how baggy they were. I cut off the elastic waistband and shortened the length of the pants...hmmm too late I realised I was a bit rash. I made the smallest hem possible. To reduce the baggy width I cut off 4 inch in width total (folded both legs together cut 2inch inside legs and tapered to crotch then sewed with the Overlocker. I hastily cut off the waist band and to add the elastic I sewed 11/4 width elastic with the Overlocker, to the new top edge of the pants then turned and topstitched down...took in 6/8 inch 2cm in from seam between pocket and lower inset.. Eventually I loved these pants! A very stressful and tedious sewing pattern. This same top pattern as day 1 was made with blue one way stretch plain cotton jersey ( I made a tube pull on skirt in the same fabric details later). This singlet was as per pattern and quick to make. Armholes and neck finished with self bias. Vogue 1550 I love you. Tunic version. Oh I love this pattern! I made it 3 times for this trip! This is the tunic length and worn over a pull on elastic waisted skirt. Confession.. I didn't do the organza centre front insert... Didn't really see the point for the look I was after. I used a seersucker linen that didn't wrinkle too much. This skirt pattern is my TNT tried and true. You could substitute any straight tube skirt pattern as this pattern is no longer available. Making the singlet top Burda 7645 and this skirt in the same fabric meant more mix and match options. The length of this dress version is half way between the tunic and the dress versions. I am 5'5" or 165 cm tall and feel more comfortable in this length. As in the previous version of Vogue 1550 I omitted the centre front seam detail. This cotton fabric is slightly ruched like a seersucker. It may also be a little see through. I packed my brown cotton Spandex tube skirt ( same pattern again Vogue 8525) to wear under the dress if I felt I needed it. I'm glad I did because it was a bit windy! I found the brown skirt to be quite comfortable even though it was hot and humid and the bonus it wasn't obvious either. I love texture and stretch fabric. I have made this pattern quite a a few times and love the bust dart that starts at the hip....it's my kind of dart! It is quite an easy & quick sew too. I shortened the dress length by 5 inches / 13 cm. To change up this dress pattern I added a centre back and centre front seam, cutting half the front and back,with stripes running vertically and half horizontally. I finished the neck and armholes with black Foldover elastic. I didn't love the dress as much as I thought I would. After I highlighted the front and back centre seams, shoulder and side seams with black Foldover elastic I was very happy with the result. I simply sewed the elastic on the edges with long straight stitch length 4. I don't use pins or stretch the elastic. If I do sew from top to bottom on one side, then I sew from top to bottom on the other side. If I make a mistake it's easy to unpick. Usually with this pattern I lower the front neck, but didn't this time. If you look closely at the picture on the dress you can see a face. It's a bike rider with a helmet. This cotton silk was a dream to wear. You can also see my brown tube skirt just peeping at the dress hemline. Glad I threw it in the case before I left! The third version of Vogue 1550 and I am not finished with this pattern! As with the orange dress I settled on the hem being half way between the tunic version and the dress version. I omitted the organza centre seam details as the Fabric was too busy for it to be noticed. I loved doing the mitred corners. This pattern was a joy to make and feels fabulous on. New Look 6461 Culottes in woven viscose Fabric with Elastic waist. 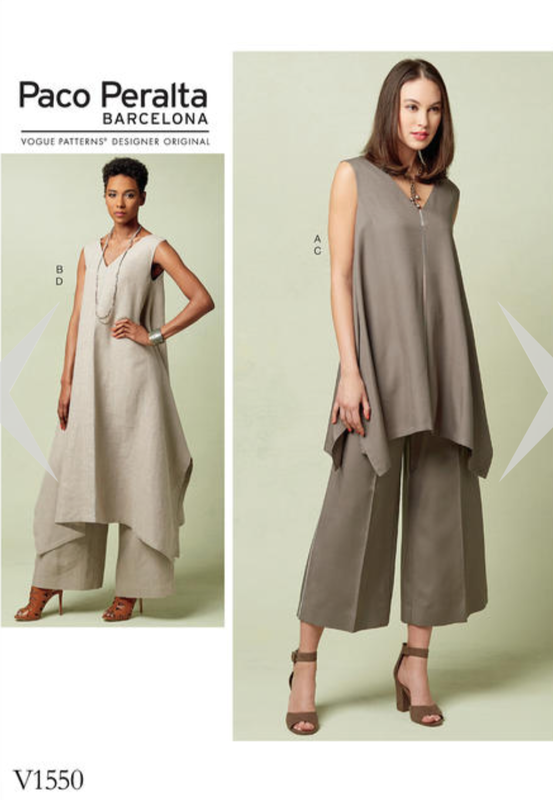 I have been looking for the perfect Culottes Pattern for a long time. These hit the mark for me. I have not shortened these pants. I have short legs! However I am really happy with the length though. I added a side split ...6 inches/ 15 cm for a little Designer touch! Not too bunchy around the waist..win! McCall's 7093 This top is everything and more! You may have this pattern in your pattern collection. Such a fabulous pattern! It goes together quickly and it is so lovely to wear. Why I haven't made this pattern more than once is beyond me. Might even add the pockes next version. A straight forward pattern. I have used a woven viscose fabric, now silk. It just works. This silk fabric is from #melbrestastash2017 The! It was inspiring and it will be worn often. 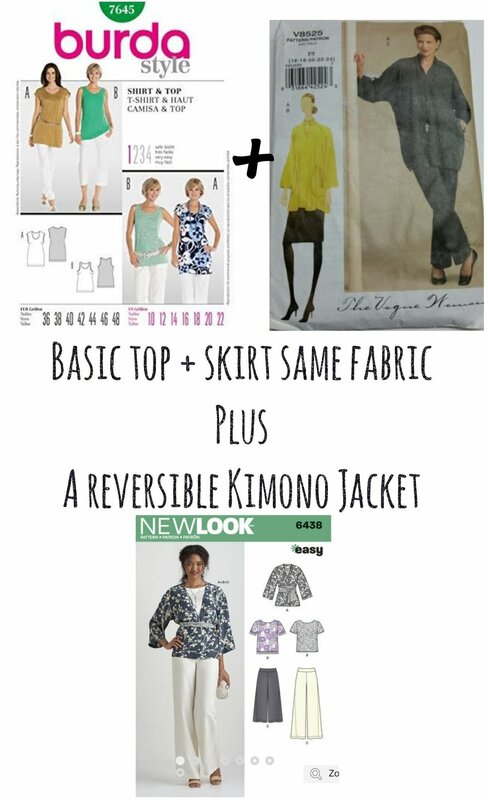 Kimono made size 20 for an oversized look and finished all joining seams with flat felled seams. I turned back the sleeve and outer edges of the jacket so that the darker side of the Fabric edge finished the lighter side of this kimono. I could have done the reverse colourway but settled for this version. The Fabric was polyester and really was easy to work with. Taking the jacket for a museum visit was good as the air-conditioning was on! This top was a nice change! You may notice the sleeves are a lot longer on my version. I have short arms but this is ridiculous. Next time I will double check the length. I intend to shorten them to 3/4 length soon. I didn't do the added binding on the seam that joins the sleeve to the flounce...I didn't think the detail would be visible with this print. I will add that the top doesn't have front darts. I think it would have been a good idea to have them for a more comfortable fit. The neck is finished with a self bias and side splits. This top was surprisingly cool to wear. Vogue 9190 Lime boiled wool from melbrestash2017. Repeat wear from day 1. Had another 6 patterns cut out for this travel wardrobe but ran out of time! All my outfits were in my hand luggage squashed..I really didn't want to have to shop for new clothes if my suitcase got lost. Great holiday made simple with the holiday Wardrobe I packed.